The blood flow in an artery depends strongly on the geometry of the vessel – but can you predict how? 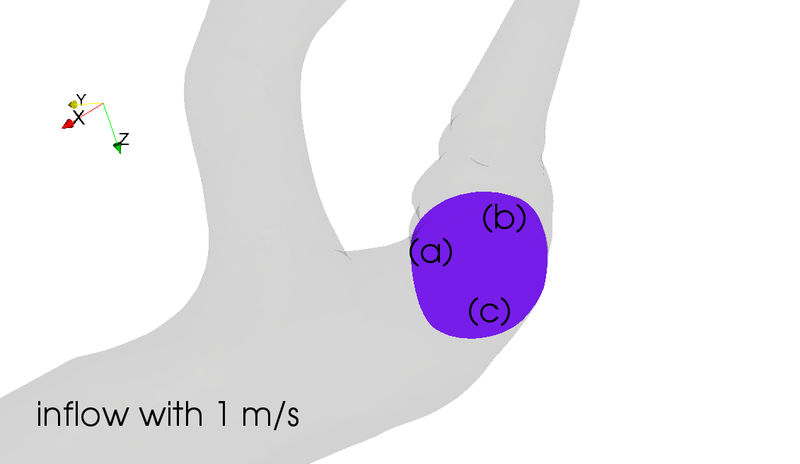 In this quiz, I show you three vessel geometries for which we calculated the blood flow. Guess at which positions the flow is fastest, and post your answers in the comments section! At which place the blood flow is fastest? Is it (a), (b), or (c)? This is a rather simple bifurcation example. The blood streams in at 1 m/s, then the vessel splits up. Take into account that the blood flow is faster when the vessel is narrower! Here, we consider the maximum velocity at each of the cuts. Here, the situation is more complicated. 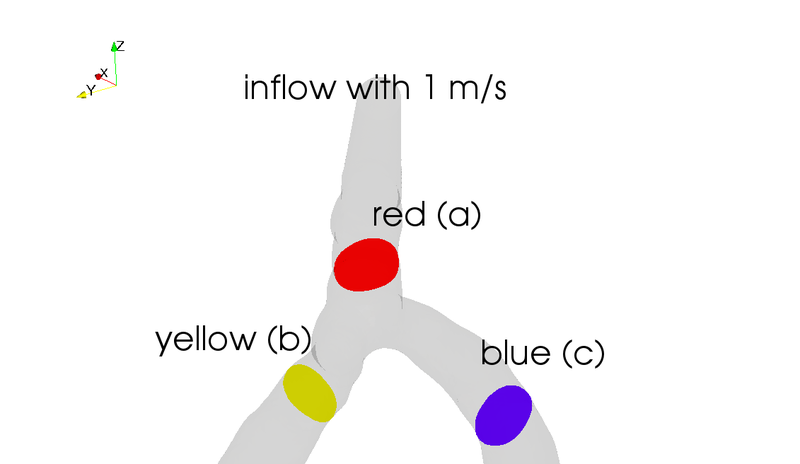 Generally, the blood flow is fastest near the centre of a vessel, and zero at the boundary. This does not help here, since all positions are at the same distance from the boundary. You have to take into account from where the blood flow comes! 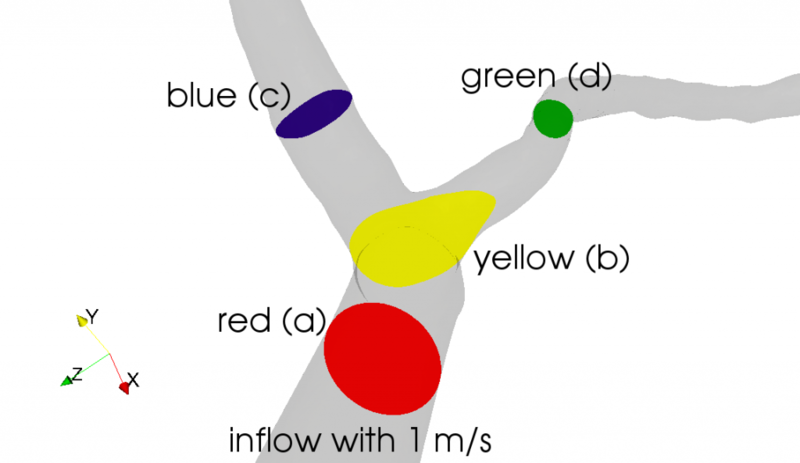 At which place the blood flow is fastest? Is it (a), (b), (c) or (d)? And finally, the most difficult case. To give you a hint, the blood flow is of very similar magnitude at three of the positions, and the maximum is obtained at one of these three! Again, we compare the maximum velocity at each of these cuts. Post your answers to the comments section! Can you clarify a bit if you are looking for an answer to each figure? Can we assume that Z always points up from the surface? According to continuum mechanics laws, flow will be faster at narrower cross-sections and to match boundary conditions, at the walls it should be zero. In addition, gravity also affects flow velocity (if it flows up/downward or just hrozintally) and it depends on the pressure field (for example if it’s close to the heart, due to pumping). The flow will (should) tend to continue in its original direction to minimize energy loss and momentum change. I assume that any curvature will cause it to slow down severly with some turbulence since pressure is also lost. That’s a really nice one. I am just guessing 🙂 I think my answers are b, a and d.
Thanks for your answers so far. The gravity acts inversely to the z direction, but gravity is less important here than the direction from where the flow comes. All the things you mentioned, Moti, should help you find the answers. I expect answers to each picture as Onur did, and will give the correct answers and some explanations by the beginning of next week!